Often known for horses and cowboys, western reads can be incredibly suspenseful and entertaining. However, the stories in Christmas Campfire Companion remind its audience that westerns can also be full of warmth and subtlety. This unique collection brings together fourteen western stories with a Christmas theme. Ranging from humorous to heartwarming, each and every tale pulls the reader in with compelling plots, rich settings, and, of course, the hearty spirit of kindness and goodwill so prominently displayed during Christmastime. Amidst bitter winter storms, adversaries come together, angelic beings help stranded travelers, families are reconnected, and lonely souls find the companionship they didn’t know they were missing. Editor Chila Woychik has done a particularly good job bringing together complimentary stories that easily flow from one to the next. Most have a warmhearted, uplifting sentiment that generally avoids becoming cloying, although more skeptical readers may not be as easily charmed. A mix of humor and tension in the various stories will help keep the book balanced and appealing to readers of more typical westerns. 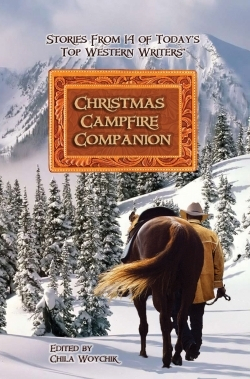 And while there are horses and cowboys aplenty, Christmas Campfire Companion could also appeal to audiences seeking a Christmas book rather than “just” a western, making it a great introduction into the genre. Recommended for ages thirteen and above, the humanity and inspiring spirit celebrated in the stories will be appreciated, understood, and truly felt by any readers. Characteristics of honor, camaraderie, family, and integrity are highlighted and with its simultaneous excitement and sweetness, re-reading this book could easily become a winter tradition.